Two years ago, Bo Bartlett put on a show of baldly didactic paintings in his signature figurative style. (See, for instance, Oligarchy, 2015-16.) 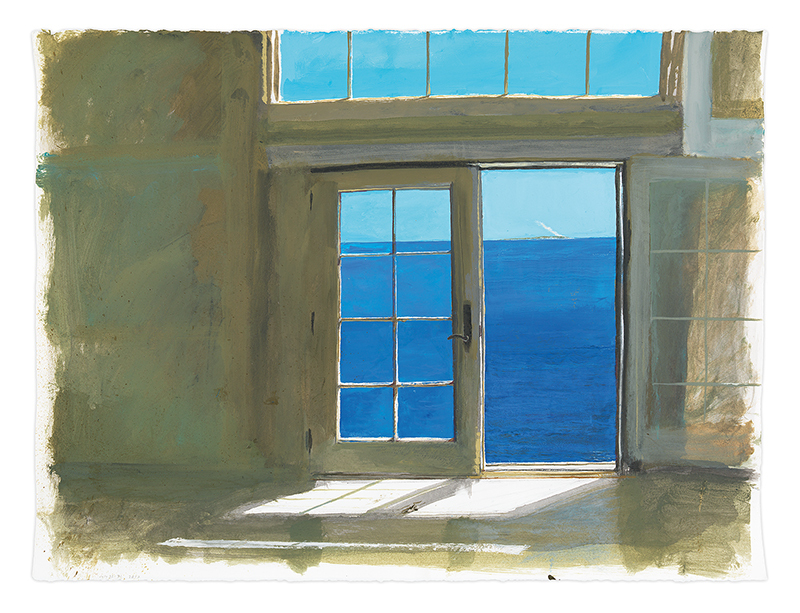 He attempted politics, it reduced him to illustrative screeds about inequality, and in defeat, he retreated to paint views of the houses on his private island. Nevertheless I'm inclined to be charitable about it. Inconsistencies plague a life of any complexity. His current exhibition at McEnery is a needed rethinking. He rendered those landscapes in gouache, watercolor's even-more-recalcitrant sibling. The matte translucency of the medium lends his detailed but unfussy drawing great richness. The surfaces of High Tide (2017) are especially lush. A recent self-portrait in oil shows him in naval get-up, saluting clan Wyeth. The Flood (2018) is more independent. A man rows his family past a church steeple that emerges from the water. Bartlett is making a point about tradition, but leaving room for the viewer to work out what.